Madeira Islands is renowned for their dramatic scenery and volcanic Landscapes which have brought thousands of tourists to their shores. So here is our Top 10 a list of the best Madeiran beaches, to help you plan your perfect Portuguese holiday. Praia Formosa is the largest public beach in Madeira, the complex consists of four sand beaches and pebbles, known as Praia Nova, Formosa, Namorados and Areeiro. Located west of Funchal, Praia Formosa is the largest public beach in the area. This beach is connected to the Lido Promenade and the Promenade that connects to Câmara de Lobos. At this complex you will find parking, showers, toilets, first aid post, a children's playground, a sports center, a football pitch, restaurants and bars. Madeira's most photogenic beach was put on the map when Winston Churchill set up on his easel here in 1949. After 50 years later the scenery has not changed: colourful boats are still lined up on the cobbles of the little beach for cleaning and repairing, same scene that Churchill painted. Ponta do Sol (Sun Point) is a village known for its beaches which are the perfect place to watch the sun setting. Hidden away in a small cove, Ponta do Sol beach is just 160 meters long, which offers spectacular water temperatures for swimming. Facilities that be found at the beach include changing room, toilets, snack bar and a games area. Parking is available close to the beach. In October, the narrow strip of west-facing rocky beach connecting Jardim to Mar and Paul do Mar is the point from the which surfers gain access to the waves. If you are looking for a calm and relaxed day at the beach, then this is the perfect option. This beach has a natural volcanic swimming pool, which offers direct access to the sea, where you can enjoy spectacular views to Cabo Girão. This small beach is located just between Lido and Formosa beach, and it is accessible by a connecting tunnel from Praia Formosa. Facilities in Doca do Cavacas beach include showers, changing rooms, restaurants and bars. Entrance fee applies. Located by the Lido promenade, this pool complex offers direct sea access, sand areas for sport activities, two pools, a children’s pool with play area. Other facilities include changing rooms, snack bars, restaurants and sun beds. Entrance fee applies. 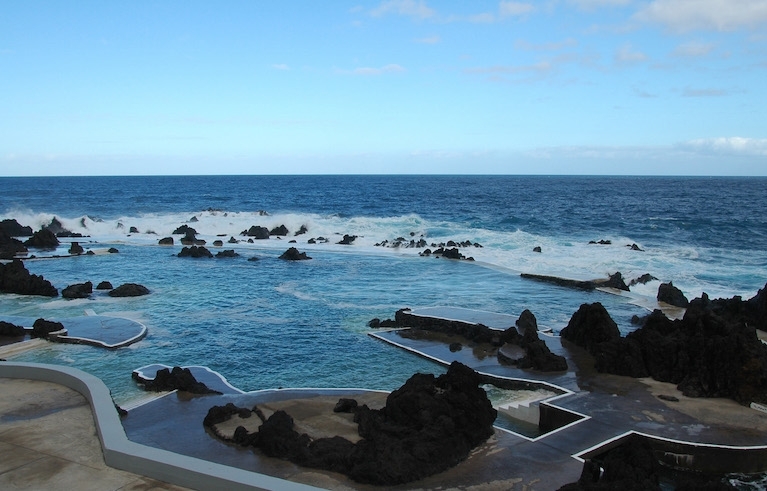 The natural swimming pools at Porto Moniz are formed by volcanic lava, naturally filled with crystal-clear sea water. Not only for their excellent bathing conditions but also for their beauty, these natural pools are the perfect place for relaxing, swimming and sunbathing. At this complex you will find children's facilities such as a swimming pool and a children’s play area. Prainha, Madeira's only naturally sandy beach, is a pretty sheltered bay with a beachside café at its eastern end. Located by São Lourenço, this beach is a black sand beach of volcanic origin which offers a magnificent mountain view. This complex offers a restaurant, changing rooms, sunshades and sun loungers (a charge applies). Praia dos Reis Magos is a very popular pebble beach, located near the village of Caniço, where you can enjoy a relaxing day on the beach. This pebble beach offers crystal clear waters for snorkeling, as well as a couple of simple cafés selling freshly grilled fish - idyllic for crowd-shy romantics. A path from the statue of Christ the Redeemer at Garajau winds down to a beach popular for snorkeling and diving. It marks the start of a marine reserve with underwater caves leading to Caniço de Baixo, which can also be reached from Lido. Hotel Gorgulho *** Just a 5-minute walk from the oceanfront in Funchal, this hotel offers a traditional restaurant and an outdoor pool with a bar. A public park and promenade are just steps away. 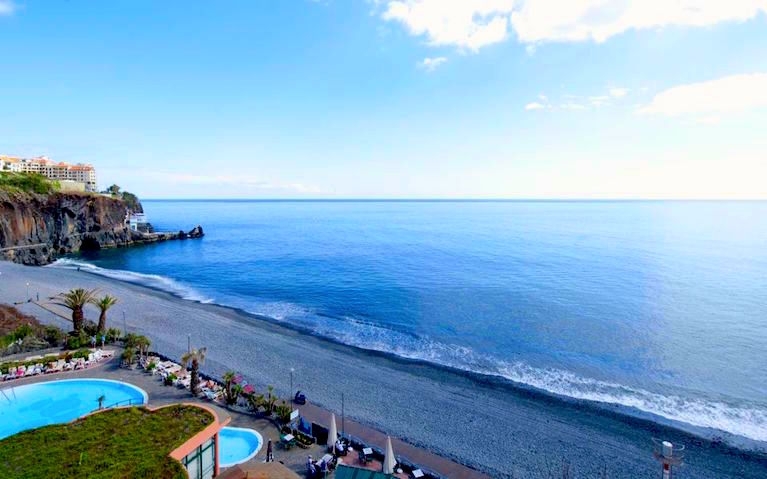 Hotel Alto Lido **** Situated 2 km from Funchal’s city centre, Alto Lido offers 2 outdoor pools and a heated indoor pool. All rooms and studios have full or partial Atlantic Ocean views. Pestana Promenade Ocean Resort **** The 4-star Pestana Promenade in Funchal is close to the Lido and offers direct access to the promenade that stretches to Praia Formosa. It features indoor and outdoor pools, an outdoor hot tub, a spa and gym.